Lion’ Mane for your BRAIN! Add Lion’s Mane Mushroom Elixir to your morning elixir, coffee, smoothie or on its enjoy as a tea to start your day in a fantastic way. To make a tea, simply add one packet of powder to 8 fluid ounces of hot water. * You can also add Instant Lion’s Mane Mushroom Elixir Mix to cooking or baking. Instant Lion’s Mane is organic, caffeine free, and suitable for vegan, vegetarian and Paleo diets. There are no sugars, starches or fillers. Lion’s Mane mushroom is an all-natural brain booster, a nootropic, with no side effects. It has been shown to improve memory, boost creativity and help with concentration by activating the nervous system and brain. Enjoy the brain-boosting benefits of Lions Mane mushroom conveniently with Instant Lions Mane! 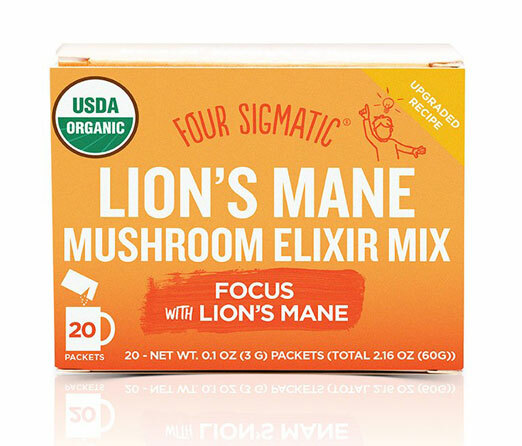 Enjoy Four Sigmatic’s Lion’s Mane Mushroom Elixir Mix while studying, reading, writing, or any time you want to enhance your focus. Additional benefits of Lion’s Mane mushroom may include improved digestion and reduction of anxiety. All Four Sigmatic Foods ingredients are of the highest quality and constantly laboratory tested for heavy metals, mycotoxins, microbial quality and pesticides. Each Four Sigmatic elixir is certified organic, sugar-free and made with dual extracted mushroom. Best of all, Four Sigmatic uses the fruiting body of the mushroom, making these sachets much more potent than using capsules made from mycelium (roots) or by products of the mushroom. The mushrooms used in Four Sigmatic’s Instant Lion’s Mane are wood-grown – exactly as they would be in the wild. You will benefit from this product if you would like to positively support your cognitive functioning naturally. Was not sure what to expect. I’ve heard many great things about Four Sigmatic and wanted to try this brain booster elixer mix. So far it’s great! Very simple to use, mix in hot water or put in a smoothie for extra power!